CHOICE is keen to see unit pricing failures in the marketplace. Have you seen inaccurate unit prices in supermarkets? Specials that aren’t special? Unit prices that don’t add up? Ambiguous prices? I see this every now and then. I will take photos next time! Harris Scarff are a company that you need to check every item that you buy to see the price you are expected to pay. There trick is to mix items in together, that look the same, but are priced differently. I have informed Consumer Affairs of this problem, with no results. I have also had discussions with the manager of my local store,who said they would have the problem rectified, but this has not been changed . I do not shop at Harris Scarff any more as the do not present their products properly. This is very interesting. Would you happen to have some photos or examples of this? We have previously had trouble with Spotlight with their Sale items. It was for rugs but apparently only for certain types of rugs. It did have small print in the paper sign and the rug we picked appeared to match that but when going to pay for it, got charged the full price. After discussion with the sales person we left it, and made a complaint. Next day the manager rang back and agreed with us and we did get the rug at the sale price. When we did go back the sign had been changed slightly. Found out later that brother-in-law had had the same problem at the same store location. Probably not unit pricing but still their Sale ticket items are not always correct and need to check the price when paying. A mix of the three, $61.25 per kilo!! I’ve actually seen it dearer in store, one week was over $100 per kilo! I know pre packed stuff tends to run a little dearer but that is ridiculous. Simply avoid the packaged option: you save money and some plastic pollution. It is the same with packaged lettuce leaves and the bulk container lettuce leaves at Coles. You can either spend $25/kg for pre-packed, or $12.50/kg from the bulk container. I don’t buy pre-packed, I was just pointing out the ridiculousness of this particular pricing. Most shops I frequent are too small to do unit pricing (under the law) and don’t do it voluntarily, but it is disclosed in their multi store / area wide specials catalogue. I would love to see it in little supermarkets, can’t be too hard to do, particularly for sales as their specials data comes from HQ and they print the tickets. Have seen same product as per 100g and 100ml or each. 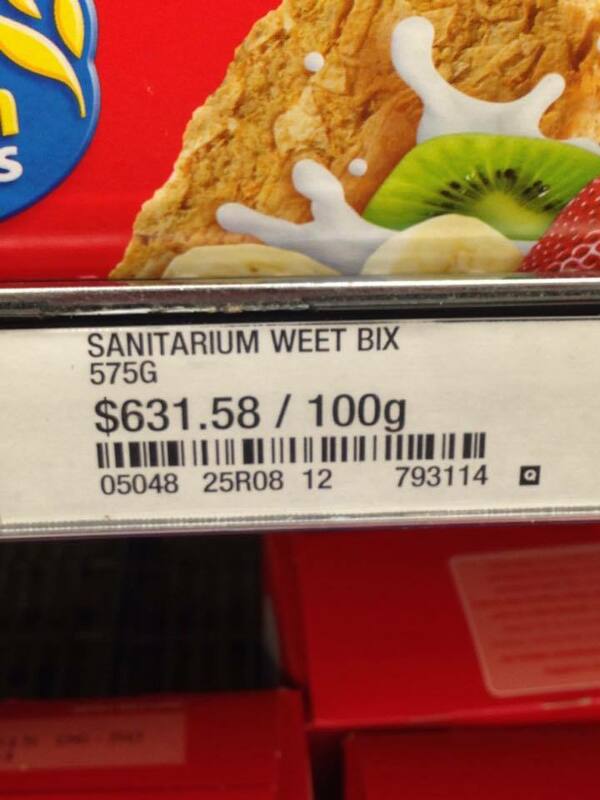 Tea bags were priced as 4cents each and $24/kg, tinned tomato as $1/100ml and $10/1kg. My gripe with Specials tags is they are sometimes under the wrong product - I now check the last few digits of the bar code against the product. I have been caught with Specials on a product eg Drumstick $4.99, tag not specifying any or all flavours, to find it only applied to a few and not disclosing this till the checkout. Also Old tags - left from last campaign - where you end up paying full price again, and missing ‘regular price’ tags. Fresh fruit & veg is a big problem with only about half with any price. My assumption, which seems to be backed up by experience, is that - no price = very dear. Another gripe - sweet corn, now only comes pre-packaged with the tops & bottoms lopped off & most husk removed, wasting about a third of the edible part. Unit price is cheaper than whole cob. I prefer to buy whole cobs and use the husks in compost, while I wait for my own corn to mature. I know what we get paid for produce and am astounded at the supermarket prices. I don’t have Aldi, Coles, Woollies or variants here. Looks like product shrinkage could be compounding the problem, something for suppliers to address? I beg to differ, @draughtrider and @BrendanMays! I was looking at the crazy price of safron in general and then began looking at the unit pricing. Just the other day, I noticed (and as you can see in this image) that other herb products were also displayed with unit pricings of $/10g. Is that not the purpose of unit pricing? To reduce product sizings to one uniform value, allowing the consumer to make an easier decision on value pricing? Although $1408.00 may seem like a silly thing to put on a ticket, this image only shows saffron products. Most other herb products display a more reasonable number for ther ‘/10g’ unit pricing. In short, it would be counter-productive to change the unit pricing of saffron from /10g to another unit price. 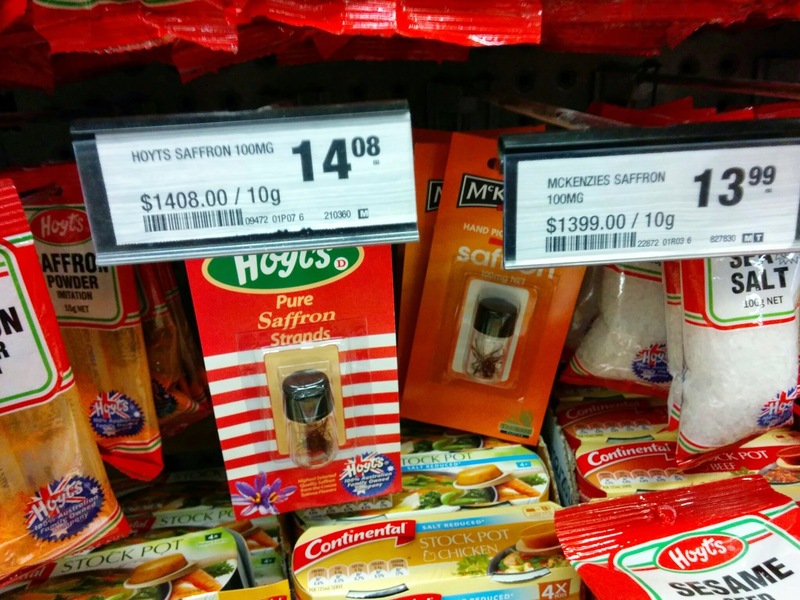 Someone else will come along and notice that saffron has a lower unit price to “trick the customers” and post an image of it on CHOICE Community. You couldn’t reduce other herb products to match the lower unit price of saffron because they are much cheaper. I believe the current system is most logical. What are other’s thoughts? Some years ago I had a Saab and the dealer also sold Mercedes and Aston Martin. During a service visit I will never forget the US EPA sticker on the Aston Martin that was something like “This car gets 5 MPG and other compact cars get 5 to 33 MPG”. You can rest assured that anyone in the market for an Aston Martin is going to be seriously concerned about fuel economy. Aston Martin - top value, top economy ! Now about those 007 options. … except you are begging to differ with a point that I didn’t make that clearly. Yes 10g units is reasonable and you are correct a lot of herbs are in 10g units, no argument there - this to me was more an example of an extreme case where the unit pricing shows a significant difference in the 10g units of 9$ but only 9c at the 10g unit I would buy it at - a difference I don’t care about - I’d avoid the Hoyts because its probably olive leaves painted red. My point was a little off topic. When I took the picture, it was more a curiosity (a year or more ago) and a party question in a sense, ‘what is the most expensive thing at the supermarket per kg’. @draughtrider Thanks for that photo! At first I thought it was a mistake, but looking at the weight - milligrams - I realise it is correct.for 10g. A good number of the public wouldn’t know what mg is and assume they were getting 10 grams. At least this shows the price and a good comparison - 100g or 1kg would end up with a (near) useless unit price = $140800.00. I want the unit price to be able to compare product, to do that needs a standardised weight or unit. Per 10g is OK but if the other product is per 100 strands, then I can’t compare. Actually, my first thought, after I realised it wasn’t a mistake, was - Why aren’t We growing this stuff!!! At that price it beats beans, pumpkins, squash, that our farm produced. I would willingly hand harvest with tweezers. Also wonder how much is real saffron … Hmmm. I realise I’ve come to this topic a bit late, but I couldn’t help posting this photo I took a couple of years back at our local Woolies. Noticed at a large, newly opened independent supermarket. Their “sale” banners (there was no shelf price labels); did not specify the unit in the Unit Price. In this example - the unit price is $1.93 - assume 457142 refers to “per kilo”. They have been open for just over a month and had some early gaffs eg with milk “per kilo”. They also charged me GST on 3 fresh fruit & veg items. I have contacted the store to inform them of these issues and have yet to get a reply. I understand, despite its size, it is a family owned & run enterprise, so I am hoping these are just teething problems. Not sure what’s so special specials. For two different Golden Circle fruit juices.